Couldn’t believe my eyes when I woke up to blue skies. Rushed out the door, there were clouds around the area so I thought it would be short lived but it stayed blue all day. 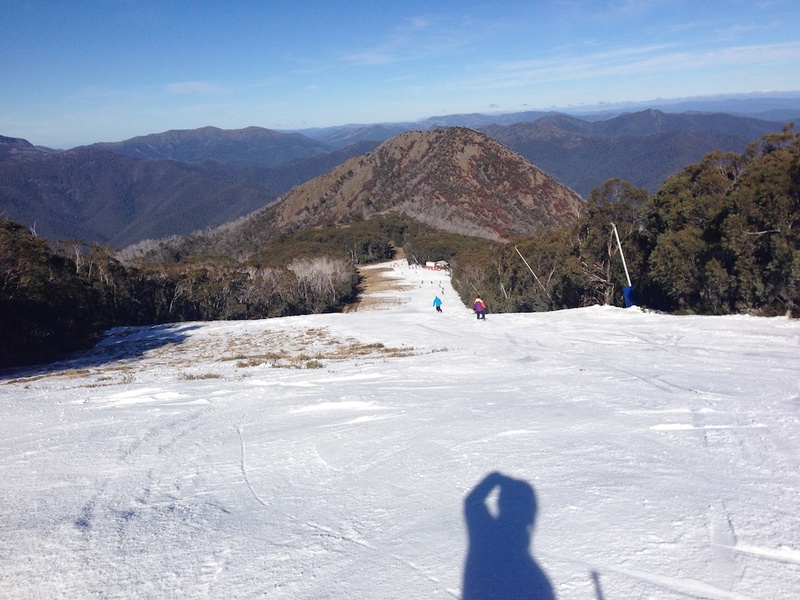 With Standard open the start of the ski day is far more palatable as I now no longer need to ride Holden – which I managed to avoid all day along with BB1 and Wombat. To not have to ride those lifts is a blessing. The warmer, wet temperatures late yesterday softened the snow which then froze solid overnight, so off-piste on the South Side wasn’t an option, so we skied Standard to Men’s Downhill which were both firm and then headed to the Summit area. Grimus hadn’t opened first thing and we were lucky enough to be near the top of Summit Chair when Patrol pulled the Closed signs and were in the first dozen to ski Summit Slide for the year. The first three runs down there were sublime, so much fun. Then the crowds found it and the queue built to enormous proportions so we decided to give it a miss until lated in the day when SCV Hut Run would have softened. SCV Hut Run softened and the crowds had gone elsewhere – this was clearly the best run of the day for us. We did a number of fast laps in the soft crud & had an absolute ball. Due to this being the first weekend of the season with any decent terrain I was bracing for big crowds but it didn’t look like they eventuated. I waited in one large line at Grimus but skied almost straight on to every lift. That said we didn’t ride Wombat at all today. All in all it was a fantastic day, we had an absolute ball mainly in the Summit area and also enjoyed skiing the Salomon & Atomic Demo skis. We’re just hoping that tomorrow dawns blue and we can do it all again! Starting to get some entries from the TBR groms in our Viddy competition – head to aussieskier.com/social and click on the Viddy Icon to check them out! There were almost 50 Instagrams tagged with #aussieskier uploaded today, be sure to check them out on aussieskier.com/social and you can ‘Like’ our Facebook Page to have them sent direct to your News Feed.